West-end Toronto stalwarts Deliluh have been making a bit of a stir in the city's underground for some time now, and an upcoming reissue of their album Day Catcher on Hand Drawn Dracula should bring them more recognition. 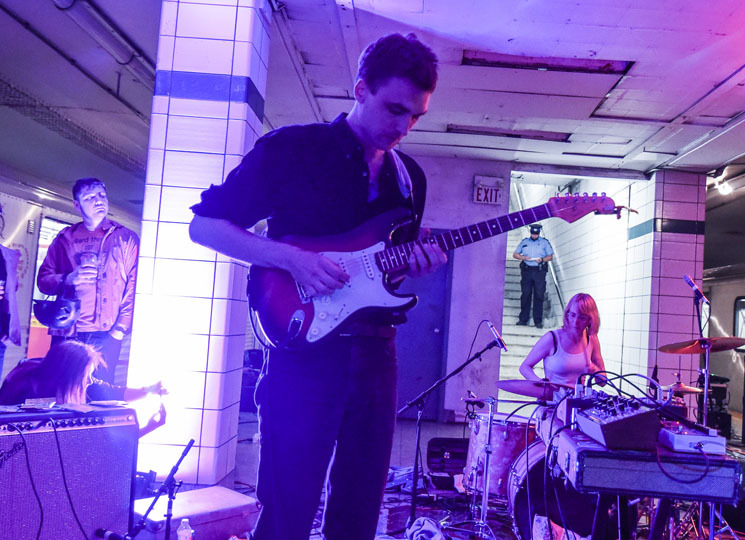 True to their DIY roots, it was the band's Kyle Knapp who apparently hatched the idea to take over the TTC's abandoned Lower Bay Station ghost stop for a night of creative mayhem. Set up on the station's platform, with the audience (and a couple of open streetcars) surrounding them on all sides, the quartet kicked things off with some ambient drone before taking things into a more exploratory noise and post-rock territory. Mixing the traditional guitar-bass-drums setup with a bank of pedals, saxophone and even violin, there was nothing predictable about their music, which pulsed along without ever losing the crowd to musical indulgence. Embodying the creative spirit of the evening, Deliluh were the perfect band for this bizarre setting. Let's hope this isn't the last time it happens.